When your roof suffers damage, it exposes your home’s structure to serious issues like water damage, mold, wildlife infestations, and more. Depending on the severity of the roof damage, it could cost thousands of dollars to have it repaired. To help prevent this from happening, keep an eye out for some of these warning signs of damage to your roof. Some of the most obvious signs of a roof leak are water stains on the walls and ceilings of the interior of your home. They may also appear as water spots, or possibly even moldy areas, on the exterior siding or on your attic’s rafters. These stains signal that there is either a leak in your plumbing or a leak in the roof, depending on the exact location of the stain. Leaks have the ability to rot your home’s infrastructure and encourage mold growth, which is why it is so important for them to be dealt with as soon as possible. Have you noticed any missing shingles, tiles or stones? Over time, high wind conditions and high heat can cause roof materials to loosen and move. In addition, animals can pull shingles from the roof. When shingles are missing, the roof is exposed to more serious damage from weather and wildlife. As long as this particular issue is caught early on, it can be repaired without negatively impacting the performance of life expectancy of the roof. Another sign of roof damage is deterioration to the fascia and soffit boards. Deterioration can be in the form of cracking, decay, etc. In some cases, there may be wood missing completely. If any of these issues are present, it could be an indication that there is water damage somewhere on the roof or it could be a sign that your gutters are not draining properly. Checking the inside of your gutters probably isn’t something that you think about doing on a regular basis. However, if you want to determine if your roof has suffered damage, this is one spot that can let you know. Various weather elements – heavy rains, hail, and heat – as well as the age of your roof can all weaken the granules on asphalt shingles. Over time, these granules will fall off. When this happens, they will go right into your gutter system. Bare shingles are not match for the elements and put your roof at increased risk of damage. Ventilation (in the attic) is key to your roof performing the way it should. For one, it helps to prevent ice dams during the winter. Take a look at your roof. Do you notice your shingles curling up at the edges? If so, this could be a sign of improper attic venting. When your shingles cup or curl, it makes them brittle and more susceptible to cracking and breaking under pressure. Shingles in this position are unable to properly protect the roof during storms. When signs of roof damage are caught early enough, especially if it is just a few missing shingles or a minor leak, repairs can be made. However, some roof damage has been left untreated for too long or it has simply impacted the structural integrity of the roof and requires replacement work. Each individual case is different, which is why an inspection is necessary. 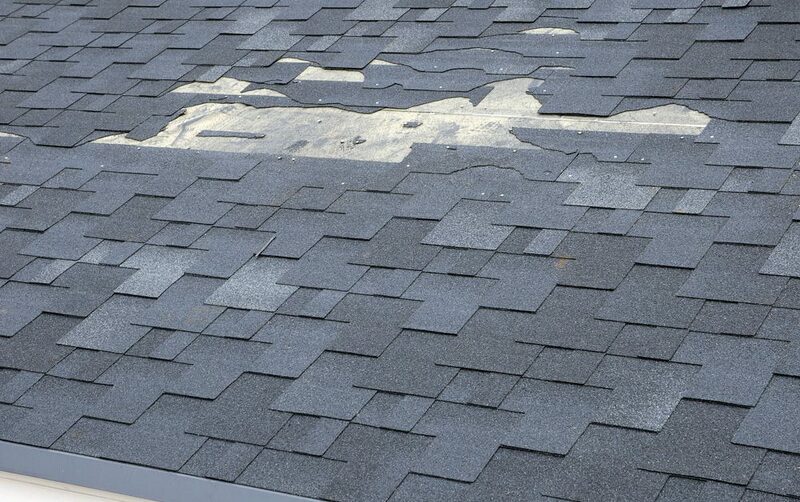 If you notice roof damage, contact the professionals at Bullard Roofing immediately.